Electronic Partners PBC repair service is one of the leading providers in the service of servo motors, servo drives or any other industrial electronic repair, service & maintenance. Having the ability to offer virtually any electronic PCB board repair we service and repair all OEM, non-warranty, upgrades and obsolete repairs, for a wide range of industrial and home electronics such as heavy industrial machines, elevators, spa, garage gates, roller shutters, washing machines. We’ve got more expertise, better equipment and more scalability than the next door repair provider. Do you service surface-mount technology circuit boards? Surface mount technology also called SMT is a design that replaces the common through-hole mounting of PCB components with direct placement on the circuit board surface. 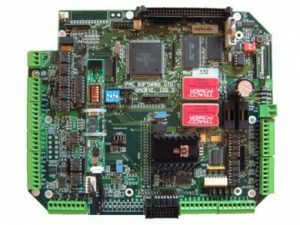 Fortunately, SMT components and packages are mostly standardized in size and form that uniformity in components can be realized which enables us to offer a PCB repair on any SMT board. A PCB also called Printed Circuit Board is used to electrically connect and mechanically support components. There are different types of PCB boards such as single sided, double sided or multilayer Boards. PCBA also called Printed Circuit Board Assembly is the complete board with all components mounted like resistors, ICs, capacitors or other components like transformers depending on the application and desired characteristics of the board. Can you replace burnt SMD components? Yes, we can offer a PCB repair as long there is no damage to the tracks otherwise we will need to repair the copper tracks. If its burned through or delaminated any traces we may need to solder in jumper wires to replace the broken trace. Can all PCB boards be repaired? The vast majority of PCB boards, including those with internal traces, can be repaired by cutting traces and adding jumpers. We’ve worked on very expensive one of kind PCB boards with unobtainable parts on them, where the cost of any repair is justified, as long as it works. To answer the initial question all PCBs? There are boards where the impedance and trace length of any repair that differs from the original will not function correctly in all circumstances. Also, boards which have caught fire are extremely difficult to repair and at some point, there is not enough left to justify a PCB repair vs replace. Is repairing my MacBook Air's logic board worth the cost? In most cases yes as a new replacement circuit board can be very costly and a PCB repair most times cost less than half the price. Expert non-warranty PCB Board services UK wide. …specialised in PCB Boards made by Cannon cooker … Almost all of our Cannon cooker model number c60dpxf Repair Birmingham are processed within 3-5 working days while also offering express repairs. Expert non-warranty PCB Board services UK wide. …specialised in PCB Boards made by KBParadise … Almost all of our V60 Repair Market Drayton are processed within 3-5 working days while also offering express repairs.